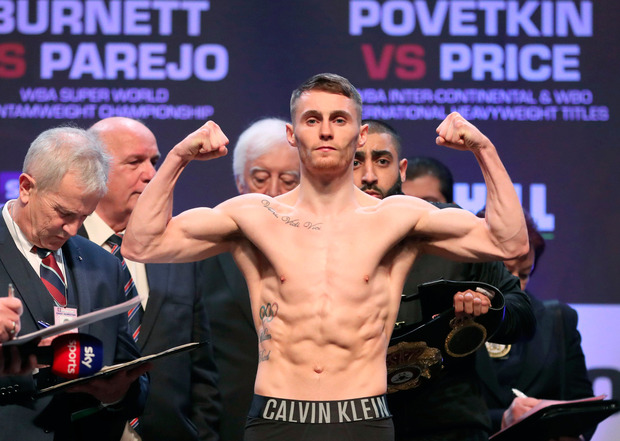 Ireland’s undefeated WBA world bantamweight champion Ryan Burnett is expected to be named on Wednesday as one of the eight boxers to compete in the second season of the lucrative World Boxing Super Series. Essentially this new competition, which had a reputed prize fund of $50m in its first season, aims to bring together the reigning World champions from the four organisations that run professional boxing, as well as four other ranked boxers and put them together in a 'champion of champions' tournament in a specific weight division. There would be four quarter-finals, two semi-finals and a final all over the regulation 12 rounds with sufficient gaps between each fight to allow the winners to recover and prepare for the next stage of the tournament. The first two tournaments in the series in the cruiserweight and super middleweight divisions respectively are down to the finals. Callum Smith is due to meet fellow English boxer George Groves in the super middleweight decider - though the latter is recovering from injury at the moment. ESPN boxing correspondent Dan Rafael is reporting that Burnett, the former WBA and IBF unified champion – he was forced to give up his IBF belt because he couldn’t defend it due to injury – together with WBO title holder Zolani Tete – who has twice defended his belt in Belfast – and the newly crowned IBF title holder Manny Rodriquez will be participating in the tournament. Prior to the first defence of his WBA ‘super’ belt against Yonfrez Parejo in March in Cardiff, Burnett’s promoter Eddie Hearn indicated that Burnett was interested in participating in the series. Unbeaten Japanese bantamweight Naoya Inoue meets England’s Jamie McDonnell in Japan later this month when the so called ‘regular’ WBA bantamweight crown is up for grabs and the winner is likely to be included in the line-up. The event is organized by German-born Kalle Sauerland. Raised in London, he is regarded as one of the most powerful figures in world boxing and the new tournament has financial backing from a variety of blue chip organisations. The quarter-finals in the two new weight divisions are likely to take place in September with the finals scheduled for May 2019.